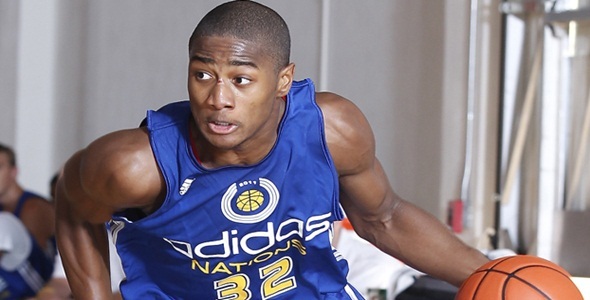 According to the Raleigh News & Observer, N.C. State freshman Rodney Purvis can take classes, but he can’t play basketball, not yet, according to the NCAA. The NCAA cleared the McDonald’s All-American from Raleigh Tuesday to go to class, but his eligibility for the upcoming basketball season remains in question. Purvis confirmed the NCAA’s decision on his Twitter account. He will be on scholarship for the academic year, according to N.C. State coach Mark Gottfried, but there’s still a possibility Purvis will have to sit out the 2012-13 season. Tuesday’s news was the first break for Purvis, who had been in academic limbo since Aug. 4, when the NCAA ruled he could not travel with N.C. State to Spain. Purvis’ high school, Upper Room Christian Academy in Raleigh, is under an “extended review” by the NCAA Eligibility Center.